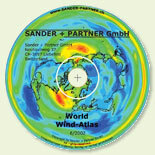 The World-Wind-Atlas is based on the NCAR/NCEP global re-analysis. SANDER + PARTNER has added some unique features. in mountain areas 1000 mbar, 900 mbar or 850 mbar may fall below topography. the height of a pressure level changes in time. For industrial applications, we have improved the original wind data of NCAR/NCEP. these heights are fixed and will never change. This is why clients report, since using the World-Wind-Atlas for long-term reference, their results show better correlation with met-mast measurements.